Mission style furniture provides a simple style that allows the beauty of the wood you select to shine. The Amish Conner Mission Bar Stool keeps it simple with little decoration. The Conner Mission Bar Stool is shown here in quarter sawn white oak wood which displays the irregular markings and flakes that result from the unique way the oak log is cut, adding a unique appeal. Custom build your mission bar stools with the wood and stain you like best. Enjoy pizza night seated at your kitchen island in these solid wood bar stools. 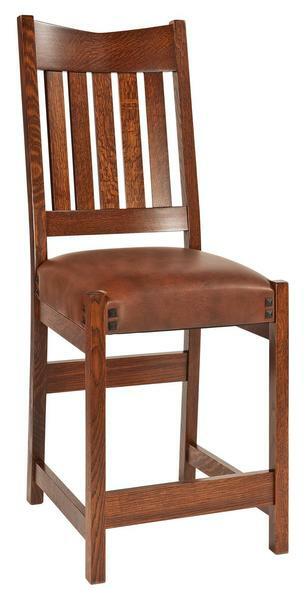 The mission style slats in the back of this pub chair cradle your back as you relax with friends and family. The wide front stretcher provides a footrest to keep you comfortable. Back Height from Seat: 23 1/2"
Shown in Quarter-sawn White Oak with FC-7992 Asbury Brown Stain. We are very happy with our last order from DutchCrafters and are considering ordering a few more pieces!